HOLLYWOOD, Calif. – Celebrate 60 years of the treasured musical classic Irving Berlin’s WHITE CHRISTMAS with the spectacular new Diamond Anniversary Edition arriving on Blu-ray Combo Pack October 14, 2014 from Paramount Home Media Distribution. Starring legendary performers Bing Crosby, Danny Kaye, Rosemary Clooney and Vera-Ellen and featuring unforgettable music by Irving Berlin, the beloved holiday film offers timeless entertainment for all ages. In honor of the 60th anniversaries of WHITE CHRISTMAS and Danny Kaye’s appointment as UNICEF’s first Goodwill Ambassador, The Danny Kaye and Sylvia Fine Kaye Foundation and Paramount Pictures are proud to make a combined $100,000 donation to the U.S. Fund for UNICEF* to support UNICEF’s lifesaving work for children around the world. As UNICEF’s Goodwill Ambassador, Danny Kaye traveled to numerous countries in 1954 to see the work of the organization firsthand and appeared in and narrated a documentary entitled Assignment Children about his experience, which is included in the new Blu-ray Combo Pack along with a new introduction by Michael Bublé. Danny Kaye received an Honorary Academy Award® in 1955 for his work on this extraordinary documentary, as well as for his unique talents, his service to the Academy, the motion picture industry, and the American people. 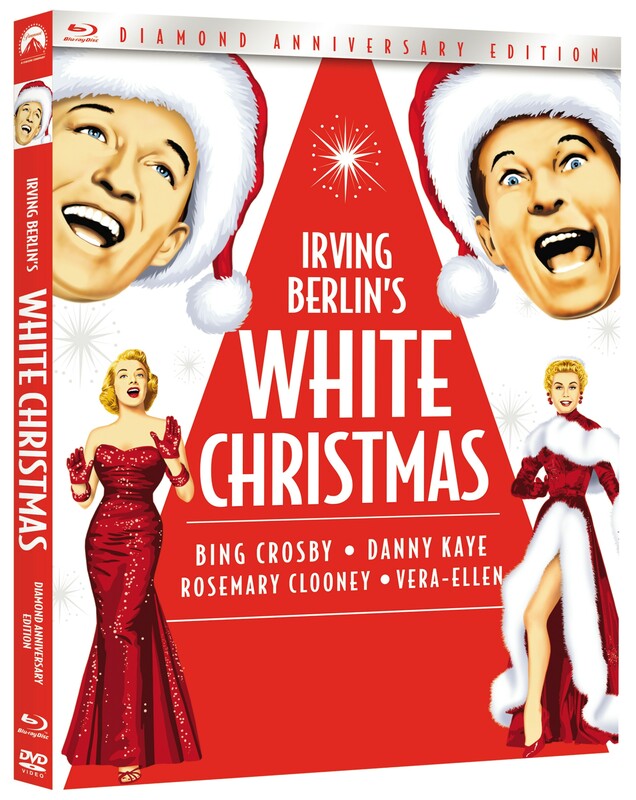 Irving Berlin’s WHITE CHRISTMAS Diamond Anniversary Edition Blu-ray Combo Pack also includes new special features such as five classic Christmas television show appearances by Bing Crosby and Danny Kaye, including a virtual duet between Crosby and Michael Bublé, an optional sing-along subtitle track that accompanies the film’s most popular songs, new photo galleries, and a Christmas CD with 12 songs featuring Bing Crosby, Danny Kaye, Rosemary Clooney, Ella Fitzgerald, Peggy Lee and Judy Garland, including EIGHT never-before-released tracks. Additional previously released special features include commentary by Rosemary Clooney, backstage stories, featurettes on Crosby, Kaye and Clooney, and more. Feature film with optional Sing-Along Subtitle Track—NEW! Backstage Stories from White Christmas—The production boasted the #1 and #3 box office stars of its time and the director of Casablanca. It featured the most popular song in American history and became the highest-ranking film at the box office in 1954. From little-known production details to behind-the-scenes trivia, this segment offers insights about the timeless holiday classic. Bing Crosby: Christmas Crooner—Crosby’s family members offer personal memories of the film and discuss the crooner’s Yuletide connection. The piece also includes film historians sharing rare stories about Crosby and White Christmas and a visit to Crosby’s hometown of Spokane, Washington. Danny Kaye: Joy to the World—Some people only know him as the silver screen’s ‘court jester,’ but Danny Kaye was a true humanitarian who helped children around the world as a UNICEF Goodwill Ambassador. This moving tribute sheds light on the multi-talented actor, who won two honorary Academy Awards®, including the Jean Hersholt Humanitarian Award, and spread joy beyond the Hollywood spotlight. Irving Berlin’s White Christmas—Many people don’t know all of the lyrics to the most popular Christmas song of all time or that Irving Berlin wrote it while sitting poolside at an Arizona Resort. This fascinating feature sheds light on the genesis and enduring popularity of the best-selling single in American history. Rosemary’s Old Kentucky Home—Take a tour of Rosemary Clooney’s home in Augusta, Kentucky, which has become a historical landmark. White Christmas: From Page to Stage— The legacy of White Christmas continues with a hit Broadway musical, nominated for two Tony awards. The film will also be available as a Diamond Anniversary Edition two-disc DVD set with Discs 2 & 3 above. *For more information visit unicefusa.org. The U.S. Fund for UNICEF does not endorse any brand or product. Loaded With Over 600 Acclaimed Documentaries DOCURAMA Launches On iOS Platforms Today!